Jason Schwartzman in a scene from Alex Ross Perry’s “Listen Up Philip”. 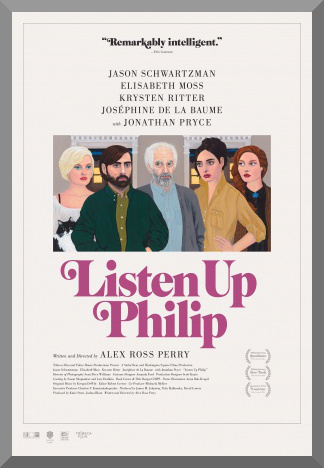 Alex Ross Perry’s Listen Up Philip is a masterclass in tediousness, allowing us the opportunity to spend 109 minutes in the presence of a protagonist who is a complete narcissist, and surrounded by supporting characters who are either similarly minded or just plain boring. The plot structure hangs by a thread, sometimes feeling more like a series of loose vignettes, except none of them have a central core. While there’s a clear aesthetic influence (‘70s comedies, from the retro fonts to 16mm film – also some early Woody Allen apparent in an ever-present voiceover and the city in which it is set), looks alone do not a good film make (just ask certain blockbuster directors). It’s uncomfortable, too long, and simply downright unpleasant at times. The film stars Jason Schwartzman as Philip Lewis Friedman, an arrogant, self-centered author based in New York City. He’s just on the cusp of publishing his second novel. At home, his girlfriend Ashley (Elisabeth Moss) is barely able to hide her growing contempt for him, but he’s entirely oblivious to this. One of Philip’s idols is Ike Zimmerman (Jonathan Pryce), a noted novelist who shares his jaded, cynical attitude. Ike offers Philip the opportunity to stay in his summer home for a few weeks, and he obliges, despite the wishes of his publisher to promote the book, which has suffered setbacks like a poor review from The New York Times. It’s clear that with Philip, he is the only person that he genuinely cares about, but as he navigates through life, that might be the only person that genuinely cares about him. What saves Listen Up Philip from being entirely dour is that it’s got some pretty good actors. Jason Schwartzman is able to work with Perry’s script, making Philip a person so repulsive that you could reasonably believe that he might exist. Jonathan Pryce’s Ike Zimmerman seems to be lifted directly from how we imagine those old, bitter writers that appear to carry a deep-seated hatred for everything under the sun. Elisabeth Moss’ character Ashley doesn’t get the heftiest material or the most screen time, but the movie is able to formulate an increasing amount of interest in her, and when the focus of the film shifts to her, attention follows very quickly. But these attempts, however skilled, can’t change the fact that they’re in a movie that is so fixated on dark comedy and neurosis that it bypasses these elements and just settles in on the humor equivalent of the uncanny valley. I admire the efforts of the cast. I admire the movie Perry was trying to make. But I just can’t admire what I saw. It’s brutally set on itself, relentlessly sour and made for a very specific crowd. And indeed, it takes a very specific crowd to appreciate following around a mopey, irritating, self-absorbed jerk of a main character around for two hours. Clearly, I am not a member of that group. I’m wondering now if I would have liked Listen Up Philip more if it had been made as a short film. The first ten minutes are suitably intriguing, as Philip meets his ex for lunch and his old friend for a beer before thoroughly dissing both of them, causing them to storm out of the counter or the bar that they were in. There are individual scenes, snapshots out of the larger movie, where Perry really hit his stride and I enjoyed what I was seeing. If those had been spliced into something, say, twenty or thirty minutes long, I have a feeling that I would have been far more entertained. As it stands, running at feature length, you’re asking a lot for an audience to tolerate this, or rather, to tolerate the character of Philip Lewis Friedman. Speaking for me at least, he definitely seems to be more suitable in smaller doses. Entrenched in nutty dialogue, soaked in admiration for the 1970s, and encapsulated from scene to scene in a narration from Eric Bogosian which ranges from sublime to infuriatingly overdone, I can see why people are fawning over Listen Up Philip like they are, but I’m unable to envision anything more than a fatal misapplication of “if it’s worth doing, it’s worth overdoing”. What was onscreen more often resembled an endurance test instead of a movie. Despite the fine acting on display, I felt actively annoyed while watching it, wishing either something interesting would happen or everyone would shut up for five seconds. Neither of these things ever did come to fruition, it seemed.